Russia and Ukraine are on their way to a system dialogue. President Viktor Yanukovich has already sounded the suggestion to finalize the provisions of the Great Treaty of 1997. Will the states develop a new format of interaction? Russia and Ukraine are on their way to a system dialogue. President Viktor Yanukovich has already sounded the suggestion to finalize the provisions of the Great Treaty of 1997. Will the states develop a new format of interaction? Which will this format be? Will it limit with the extension of field interaction or this kind of cooperation will develop into a system dialogue in the frameworks of this or that union? Can Russia suggest anything except for the Customs Union, which could involve Ukraine? What are the prospects of intercultural integration: uniting of educational system, harmonization of language policy, interaction within the framework of “Russian world”? “Politkom.ru” asked Ukrainian experts in political analysis these issues. I think that the dialogue is not that systemic. After unexpected Kharkov breakthrough there were plenty of various suggestions on field cooperation. It seems the case is about all developments on rehabilitation of corporate relations, performed during recent years. Respectively, it’s incorrect to talk about new format of interaction – strategy of Russian authorities evidently doesn’t get on the tactics of economic entities. Indeed, even the suggestion itself to join the Customs Union looked like a half-joke impromptu. Russia has no serious suggestions left. As it seems, there is nothing surprising as Russian authorities didn’t consider the need in deeper working out of integration initiatives even within the context of the victory of Yanukovich – no one expected either a rapid inner political victory either a readiness and ability to dialogue with the Kremlin, or a fascinating flexibility within the issues seemed to be principally important for the maintenance of Ukrainian sovereignty. Moscow suggested the continuation of the “cold war” with gradual raking off strategically important assets from Ukraine. They were not prepared to the established situation. As for an intercultural dialogue, Ukrainian authorities have neither definite view on these issues, nor understanding of the necessity of the kind of dialogue. If the situation develops as it does now, then they will definitely achieve a new format. The proposal of Ukraine to finalize the Great Treaty of 1997, probably, is the beginning of the way to a new quality of cooperation in a new format. Till now, only Ukraine has restrained and evidently sabotaged the work under extension of mutually beneficial economic and political cooperation, in bilateral format as well as within the frameworks of the CIS. Today it shows initiative and that is why there are no principal obstacles for getting down to a deeper format of cooperation. Both states are already developing joint projects, which involved Ukraine and by this don’t demand its joining the Customs Union yet. And here the extension of a field interaction already now immediately turns into field integration projects, which, without bias, strengthen manufacturing and selling potential of Ukrainian and Russian enterprises. These are joint projects in nuclear energy, which anticipate construction by Russia of new nuclear reactors in Ukraine and the participation of Ukraine in International Center on Uranium Enrichment for the NPP in Angarsk. The kind of level of field interaction is, in the essence, the beginning of field integration. Also the interaction within aircraft field, where we are talking about the association of Ukrainian aircraft industry represented by the group of companies “Antonov” with an analogues Russian field in the organizational frameworks of Russian united aircraft producing corporation. Most likely the integration within metallurgy will enhance. Metallurgic industry of Ukraine within a post-crisis period experiences definite difficulties with selling of products and extension of production. Russian metallurgic companies possess resources to buy cheap Ukrainian metal enterprises to enhance its positions within the market. For Ukrainian metallurgic field this is a possibility to return to the markets lost during the crisis period. Of the same kind is the suggestion of the Russian Government Chairman V.V.Putin on the alliance of Gazprom with Naftogaz. There is nothing unexpected here, as some experts thought in the beginning. V.V. Putin simply spreads on oil and gas industry those approaches, with which the both states have already agreed in other fields. And the situation around this suggestion will develop. Even more intensive cooperation evidently will be deployed within the line of fundamental and applied scientific researches in the sphere of R&D within front lines of scientific-technical progress. This task flows logically from joint projects, for example, within nuclear and aircraft industries. Here the two states have common tasks – to adapt science and technologic developments for the tasks of economy modernization. Following Russia, in Ukraine with the coming of a new power they realized the critical importance for economy the raise of labor productivity and rapid enhancement of science-intensive products and products with high value added. As a result, interstate manufacturing cooperation and field integration will reach higher level. In general, for Ukrainian authorities, it’s evident that to maintain the possessing industry, to modernize it, to maintain the ability of the country not simply to consume innovation, but to produce them is only possible by rehabilitation of used to be common technologic chains, manufacturing cooperation and minimum field integration first of all with the Russian Federation. The issue on Customs Union probably will be raised once again, even if not now, then during the accomplishment of planned and prospect bilateral economic and humanitarian projects. In general, the membership of Ukraine in any integration union within post-soviet area will somehow depend on the economic situation in the EU and its eastern policy. With the clarification of political, institutional and simply technical impossibility of Ukrainian joining the EU, the work over the membership of Ukraine in the Customs Union will promote. In humanitarian sphere the processes of rapprochement and joint projects in principle have no limits. Due to ideological character of a number of humanitarian issues, the resistance to constructive Russian-Ukrainian interaction here will be more violent. However, those Ukrainians, who suspiciously treated the strengthening of the interaction with Russia, after the extremities of Yushchenko cave-like nationalism, will hardly support nationalistic opposition. Probably, the acceleration made by President Yanukovich after the coming to force within Russian-Ukrainian cooperation opened new prospects faster than expected, and together with them put new tasks. They should be solved considering the interests of the both states to fix the prospect of the direction and the algorithm of bilateral interaction. The new Treaty can cover only the assurance of new organizational forms of interaction, new liabilities of parties, etc. Judging on how fast the things develop the new format Ukraine-Russia is pretty possible within a middle-term prospect, in 2-3 years, but not now, of course. If Yanukovich manages to stay at power and to get out of economic crisis successfully, then he will be interested in higher permanent format of our states integration. And the format still should be designed. This is the job for analysts today! I would announce a contest on the kind of integration projects. Most likely, considering also the problems with Belarus, at first this will be “underconfederation”, not a state, but a social-economic union, similar to the old EEC – the EU predecessor. (The history of the EEC treaties could help!) I.e. plenty of field and common treaties gradually finalized into a political union. In general, economic, and then also political, and, maybe, military-political union. As military-political union with Belarus already exists, de facto and de jure. I’m sure that cultural integration will promote. We have similar standards. 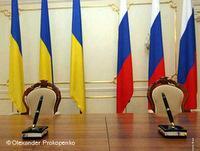 There are no borders between Russian and Ukrainian nations. Russian language automatically forces others out. It’s better to say, brings them to their level. Eventually, Russian language will also be really “pushed” as a regional one. Today there is already a bill draft of Kolesnichenko in Rada. And then – that’s it: the wheel of ukrainization will turn back to the natural rusification of Ukraine. And if the “oranges” had to force it up, introducing new absurd bans, then now it will go down with acceleration. There will be only the issue on ethnic identification of Ukrainians as a special, different from Russians “branch” of evolution and parasiting parties over this. But this is also an issue of propaganda. In a definite sense they have already developed a new format, to be more precise they are developing it. We are talking about the format of strategic partnership in the sense it was announced in the Great Treaty of 1997. Then this format was claimed, but it wasn’t fully accomplished. By Yushchenko it turned into fiction at all. Now it’s being rehabilitated in the kind it was declared in 1997. Yanukovich suggests to promote its on the ground of the Great Treaty, specifying and developing its individual provisions. Careful analysis of Yanukovich’s statement on this allows suggesting that it’s planned to prepare an interstate program of social-economic and humanitarian cooperation minimum for 10 years and the treaties on individual directions of cooperation. But it seems that the new Ukrainian power starts realizing that the accelerated rapprochement with Russia provokes acute domestic political conflicts and definite alert in West. That is why they have decided to slow down a bit, which is proven by the information on the drafts of interstate agreements, which are planned to be signed during the official visit of the Russian Federation President D. Medvedev to Ukraine on May 17th-18th. It was expected that there will be more of the kind of documents than 5 agreements (according to the information of the First Deputy Prime Minister of Ukraine A.Kliuyev there will be much more documents than 5 agreements). Extension of field interaction (within individual directions), most likely will take place, but on different levels and in different forms. Hardly, “revolutionary” integration initiatives of V. Putin will be accomplished fully. “During the exclusive interview to “Facty” (ICTV channel) Minister of Fuel Yury Boyko reported that among the documents that are generally ready for signing there is an interstate agreement on finalization of the 3rd and 4th power units of Khmelnitski nuclear power plant. They are developing a 10-years contract for the purchase of nuclear fuel for domestic NPPs – prices will be grounded on world trends and formulas, assured Boyko. Ministry of Fuel and Energy also demands for Russia to guarantee definite scopes of oil and gas transit for the following 10 years. And as for the suggestions of Russia to ally “Gazprom” and “Naftogaz” Minister thinks that it is impossible”. This is a literary quote from the news of ICTV channel. I can add that Yanukovich and Azarov weren’t enthusiastic about the association within the sphere of generation (on nuclear energy). Ukraine can’t be a member of the Customs Union (due to its WTO membership). But Ukraine is interested for the free trade area between Ukraine and Russia operates in full scale. As for intercultural integration, if we are talking about “rusification” of Ukrainian humanitarian sphere, then the kind of actions will definitely enhance political conflicts and tensions within Ukrainian society, not less than it happened after Kharkov agreements. Most likely, the cooperation within humanitarian and educational spheres will activate and extend, but without “integration” which can incite obvious rejection and protests of a part of Ukrainian society.